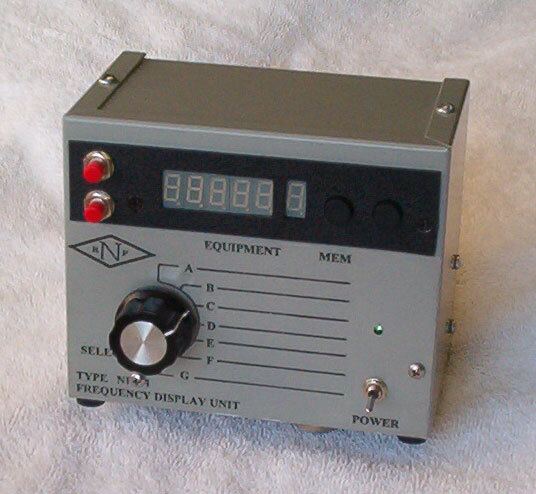 The National RF Type NFD-1 Frequency Display Unit was designed for use with vintage and classic communications equipment, to display the received or transmitted radio frequency. The unit incorporates an internal processor that allows the intermediate frequency (IF) to be counted out by the frequency counter. The resultant display is the actual frequency that the equipment is receiving or operating at. The unit consists of a high gain radio frequency amplifier that amplifies the local oscillator signal of the radio to a level that the counter circuit will count. Four separate memory channels are provided that allow the user to program the unit for four different IF frequencies. Typically, vintage/classis receivers may utilize IF frequencies of 165 KHz, 455 KHz, 1.8 MHz or 10.7 MHz. Although not limited to these frequencies, each of the four memory channels may be programmed for these IF frequencies, thus allowing the counter to count out these frequencies and display the actual frequency of reception or operation. Or, if the user desires, no IF offset may be programmed and a sense wire or whip antenna attached, thus allowing the unit to display transmit frequencies of vintage transmitters and transceivers. A front panel equipment selection switch allows a total of 7 pieces of equipment to be interfaced with the unit. The user simply selects the equipment in use and selects the required memory channel to display the operational frequency. In addition to allowing programming for virtually any IF frequency up to about 55 MHz, the unit can be programmed to accommodate receivers that tune increasing frequency with a local oscillator that decreases in frequency. This is common on multi-conversion super-hetrodyne receivers, and particularly on the Collins S-Line equipment, where crystal controlled front-end converters feed a tunable IF strip. Furthermore, the unit will allow for the local oscillator to be either on the high side of the received frequency or the low side. On older receivers, where local oscillator stability may be an issue, the unit may be programmed to disable the Hundred Hertz digit, thus making 1 KHz the minimum frequency resolution. Usually, this is acceptable for unstable vintage equipment. In order to sense the local oscillator signal of the vintage/classic equipment, the user will have to enter the radio equipment to install a sense wire loop near the oscillator coils. Optionally, the user may have to install a low value coupling capacitor to the oscillator circuit that will couple RF energy to the display unit. Interface instructions for this operation are provided with the hardware, and recommendations for which technique to use for various manufacturers of vintage equipment (National, Collins, Hammarlund, etc). The input impedance of the frequency display unit is sufficiently high that it will not detune the local oscillator that it is coupled to, particularly if the interfacing cable is kept as short as practical to minimize shunt cable capacitance. 10 MHz to 25 MHz; -33dBm. Ave.
25 MHz to 35 MHz, -26dBm. Ave.
Power: 12 volt DC wall-type power transformer provided, current draw 135 MA, typical. Equipment Interface: 7 BNC rear panel female connectors selectable from front panel rotary switch. 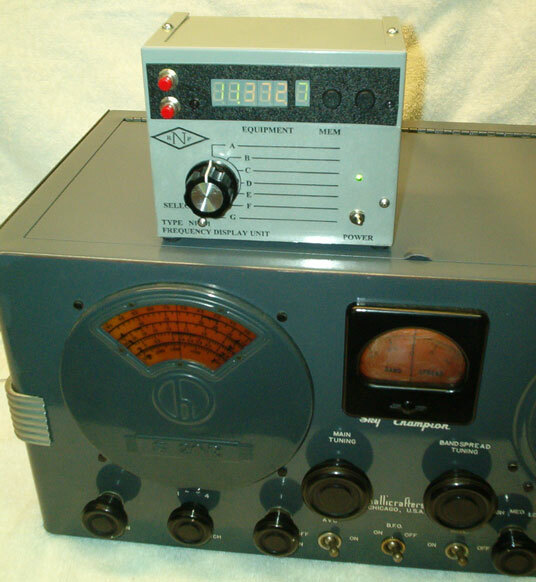 Should you have further questions on this unit and its interface to specific classis/vintage radio equipment, please contact National RF, Inc. at the phone numbers listed on this website. Price: $289.95 plus $7 UPS Ground shipping/handling charge, continental USA. OVERSEAS CUSTOMERS: Please contact National RF for the shipping charge and delivery schedule to your country.